Many school districts made decisions to cancel or delay classes on Wednesday. There were more than 478 closings or delays reported to NBCDFW as of 6:22 a.m. Wednesday morning. Dallas, Arlington, Denton, Fort Worth, Irving, Garland, HEB, Keller, Plano, Lewisville, Frisco, McKinney and many more school districts decided to close school on Wednesday. A complete list is available here, or at the links below. More than a dozen schools decided to start school at 10 a.m. or call for a two hour delay on Wednesday. 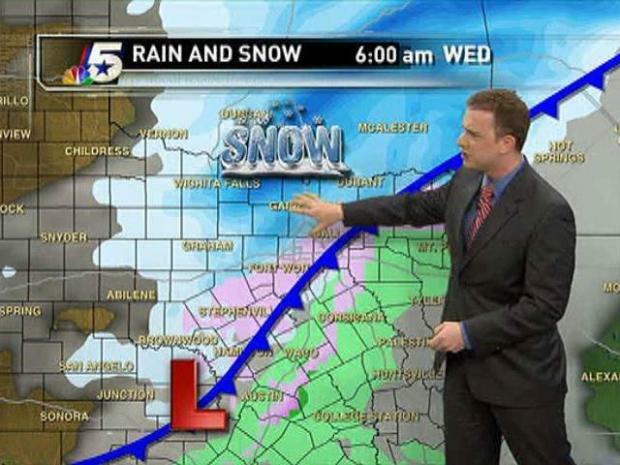 Meteorologist Grant Johnston updates the forecast for Tuesday, February 8, 2011. NBCDFW expected to see more closings or delays throughout the night Tuesday and early Wednesday morning. Many schools decided to close after seeing updated forecasts around 5:00 a.m. Wednesday. North Texas school children and parents don't have to wait for the crawl during the news to find out if their district is closed. NBCDFW offers email and SMS alerts for school, business and church closings. All you have to do is CLICK HERE to sign up and when your school, business, daycare or church closes, a text message or email will be sent to your mobile device or email inbox.